While the policy context seems to change almost daily, those of us in the field continue to work on our NSF awards with the same commitment, focus, and enthusiasm. A new set of DR K-12 proposals has been accepted for funding. Some are returning PIs while others are new to the NSF world. We welcome them all, and in this newsletter, you will find a listing of these new colleagues and their projects. We think you will find their proposed projects to be of great interest, and ask you to give special attention to the CAREER grants. If you are a new PI, or a grantee who wants a refresher, we encourage you to attend the "Nuts and Bolts" webinar on December 16th. We are also pleased to welcome our fifth cohort of CADRE Fellows. We received more applications than ever from a very impressive group of early career researchers and developers. The Fellows will meet at EDC on November 7-8 to kickoff the year's activities, learn about each others' work, and become oriented to the program. This year, CADRE’s activities will focus largely on dissemination. Our website will continue to feature project spotlights that highlight activities, products, and insights from ongoing and concluding projects in the DR K-12 portfolio. We are now focusing on engineering, a spotlight on gaming will close the 2013 calendar year, and an archive of past spotlights will be available on the website. In addition, we are rolling out changes to the website that we hope will better feature DR K-12 work. You may have noticed the new home page and resource page layouts. If you are developing a DR K-12 proposal, the website offers potentially useful resources: the portfolio analysis to learn what has already been funded; documentation from past webinars on the DR K-12 solicitation; and a hot-off-the-press targeted study on DR K-12 engineering projects. If you are looking for advisors for your proposed project, Project Smart Search on the CADRE website might be a valuable resource. If you need assessment instruments, the Instrument Compendia will be a good place to start. For these and other proposal writing tools, spend a little time on cadrek12.org. On behalf of the CADRE network, we would like to congratulate and welcome all recently announced DR K-12 awardees. 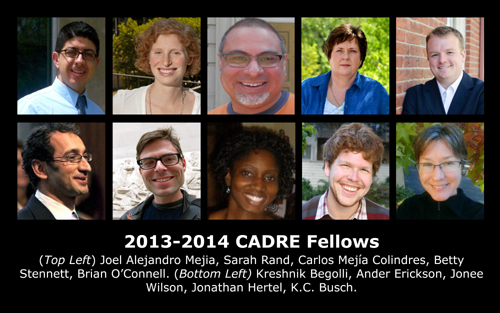 Congratulations to the recently selected 2013-2014 CADRE Fellows! The CADRE Fellows program, now in its fifth year, is a competitive fellowship designed to be a capacity-building experience for emerging researchers and developers. The Fellowship is awarded both to recognize early career accomplishments and as an investment in originality, insight, and potential in the field of STEM education. This year's selection process was especially challenging as we received a record number of highly competitive applications for the ten available spots. Thank you to everyone who applied. The Fellowship will take place from October 2013 to June 2014 and include two in-person meetings: an orientation meeting in Massachusetts and a meeting at the National Science Foundation. Fellows will also participate in a series of capacity-building activities on topics such as tips for getting published, preparing a proposal, and career pathways. Learn more about the CADRE Fellows Program here. Over the past five years, national interest in K-12 engineering education has been growing. More schools and out-of-school programs are incorporating engineering lessons and activities—creating windmills, designing water filtration systems, planning buildings of the future, etc. The National Assessment of Educational Progress will launch a new exam on engineering and technology in 2014, and the Next Generation Science Standards (NGSS), released in April 2013, integrate engineering concepts and practices. Yet despite the growing prevalence of engineering standards in most states, it is estimated that only 10 percent of K-12 students are exposed to engineering-related coursework in school. The National Science Foundation is a major supporter of engineering education and the research needed to ensure effective programming and skilled teachers. The current Spotlight on Engineering provides examples of NSF-funded programs that show promise for educating future generations of scientifically literate and engineering-talented adults. Have questions about the newest DR K-12 solicitation? Three webinars, led by NSF's Edith Gummer, Karen King, and Elizabeth VanderPutten, were held to clarify some of the new and more complicated aspects of the DR K-12 solicitation, as well as give background on the DR K-12 program. View the PowerPoint slides and recordings of the DR K-12 Program webinars here. Use CADRE's Project Smart Search to find projects working in these and other areas of interest. These resources are also available online. Improving STEM education in the United States is a priority expressed by policymakers, practitioners, and business leaders. CADRE's recently released brief, Moving STEM Education Forward: National Priorities and the National Science Foundation's DR K-12 Program, describes the innovative research and development projects that could help propel needed changes in STEM learning. The brief is grounded in ideas put forward in 12 recent reports on STEM education. With capsule descriptions of current R&D projects, the brief illustrates how studies now under way may help give life to the experts' recommendations. These projects, all funded by the DR K-12 program, were chosen to show a rich variety of efforts to understand learning and teaching in the STEM fields and to develop new learning opportunities for children, youth, and their teachers. Reviewing this report could prove helpful in thinking about representing your own project's work in light of national STEM reports and priorities. With capsule descriptions of current R&D projects, the brief illustrates how studies now under way may help give life to the experts’ recommendations. These projects, all funded by the DR K-12 program, were chosen to show a rich variety of efforts to understand learning and teaching in the STEM fields and to develop new learning opportunities for children, youth, and their teachers. Reviewing this report could prove helpful in thinking about representing your own project’s work in light of national STEM reports and priorities. Download the brief. For more information, contact Derek Riley (driley@policystudies.com). We invite new and returning awardees to take part in the upcoming NSF Nuts & Bolts webinar, hosted by CADRE on Monday, December 16, from 2:00-3:00PM EST. The webinar is designed to introduce awardees to the ins and outs of project management. This session is adapted from the in-person session previously held during PI meetings. Participants have regularly given this experience high marks in annual evaluations. The recording and slides from last year's session are available on the CADRE website for those who want a refresher. Register for the December 16th Nuts & Bolts Webinar here. You may also wish to invite your project directors or other team members to participate. On December 3, the next workshop in the STEM Smart: Lessons Learned from Successful Schools series will take place in Washington, DC. 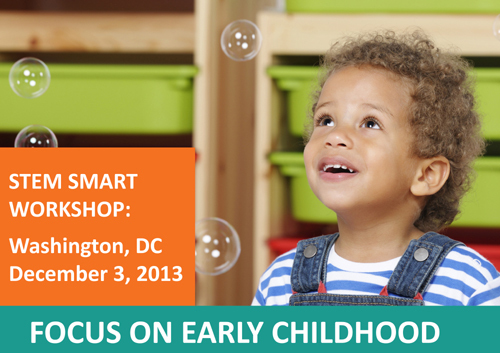 This event, which will highlight issues and findings from the National Research Council reports, Successful K-12 STEM Education and Monitoring Progress Toward Successful K-12 STEM Education, will also place a special focus on the critical importance of STEM learning and early intervention in pre-K through third grade. Selected researchers, developers, and teacher leaders will offer plenary presentations and breakout sessions highlighting projects, initiatives, and resources—many funded by the National Science Foundation—that have an evidence base on effective instruction, provide access to high quality STEM for all students, and/or build supportive infrastructures. This meeting is hosted by the NSF and organized by CADRE, in conjunction with the Smithsonian Institution and the Smithsonian Early Enrichment Center. CADRE would also like to acknowledge DR K-12 PIs, past and present, who will be presenting at the event: Marina Bers, Kimberly Brenneman, Douglas Clements, Ximena Dominguez, Richard Lehrer, Ashley Lewis Presser, Julie Sarama, Karen Worth, and Betty Zan. For more information, visit the event page on the STEM Smart website.